"Third power" redirects here. For the band, see Third Power. "Cubed" redirects here. For other uses, see Cube (disambiguation). "³" redirects here. Its literal meaning is the numeral "3" in superscript. y = x3 for values of 1 ≤ x ≤ 25.
n3 = n × n × n.
n3 = n × n2. This is also the volume formula for a geometric cube with sides of length n, giving rise to the name. The inverse operation of finding a number whose cube is n is called extracting the cube root of n. It determines the side of the cube of a given volume. It is also n raised to the one-third power. The cube of a number or any other mathematical expression is denoted by a superscript 3, for example 23 = 8 or (x + 1)3. The graph of the cube function f: x → x3 (or the equation y = x3) is known as the cubic parabola. Because cube is an odd function, this curve has a point of symmetry in the origin, but no axis of symmetry. Geometrically speaking, a positive integer m is a perfect cube if and only if one can arrange m solid unit cubes into a larger, solid cube. For example, 27 small cubes can be arranged into one larger one with the appearance of a Rubik's Cube, since 3 × 3 × 3 = 27.
n3 − (n − 1)3 = 3(n − 1)n + 1. (n + 1)3 − n3 = 3(n + 1)n + 1. There is no minimum perfect cube, since the cube of a negative integer is negative. For example, (−4) × (−4) × (−4) = −64. Unlike perfect squares, perfect cubes do not have a small number of possibilities for the last two digits. Except for cubes divisible by 5, where only 25, 75 and 00 can be the last two digits, any pair of digits with the last digit odd can be a perfect cube. With even cubes, there is considerable restriction, for only 00, o2, e4, o6 and e8 can be the last two digits of a perfect cube (where o stands for any odd digit and e for any even digit). Some cube numbers are also square numbers; for example, 64 is a square number (8 × 8) and a cube number (4 × 4 × 4). This happens if and only if the number is a perfect sixth power (in this case 26). 23 = 23 + 23 + 13 + 13 + 13 + 13 + 13 + 13 + 13. The equation x3 + y3 = z3 has no non-trivial (i.e. xyz ≠ 0) solutions in integers. In fact, it has none in Eisenstein integers. Both of these statements are also true for the equation x3 + y3 = 3z3. Visual proof that 13 + 23 + 33 + 43 + 53 = (1 + 2 + 3 + 4 + 5)2. Visual demonstration that the square of a triangular number equals a sum of cubes. In the more recent mathematical literature, Stein (1971) uses the rectangle-counting interpretation of these numbers to form a geometric proof of the identity (see also Benjamin, Quinn & Wurtz 2006); he observes that it may also be proved easily (but uninformatively) by induction, and states that Toeplitz (1963) provides "an interesting old Arabic proof". Kanim (2004) provides a purely visual proof, Benjamin & Orrison (2002) provide two additional proofs, and Nelsen (1993) gives seven geometric proofs. is known for the special case of d = 1, or consecutive cubes, but only sporadic solutions are known for integer d > 1, such as d = 2, 3, 5, 7, 11, 13, 37, 39, etc. In the sequence of odd integers 1, 3, 5, 7, 9, 11, 13, 15, 17, 19, …, the first one is a cube (1 = 13); the sum of the next two is the next cube (3 + 5 = 23); the sum of the next three is the next cube (7 + 9 + 11 = 33); and so forth. Every positive rational number is the sum of three positive rational cubes, and there are rationals that are not the sum of two rational cubes. 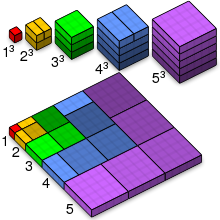 In real numbers, the cube function preserves the order: larger numbers have larger cubes. In other words, cubes (strictly) monotonically increase. Also, its codomain is the entire real line: the function x ↦ x3 : R → R is a surjection (takes all possible values). Only three numbers are equal to their own cubes: −1, 0, and 1. If −1 < x < 0 or 1 < x, then x3 > x. If x < −1 or 0 < x < 1, then x3 < x. All aforementioned properties pertain also to any higher odd power (x5, x7, …) of real numbers. Equalities and inequalities are also true in any ordered ring. Volumes of similar Euclidean solids are related as cubes of their linear sizes. In complex numbers, the cube of a purely imaginary number is also purely imaginary. For example, i3 = −i. The derivative of x3 equals 3x2. Cubes occasionally have the surjective property in other fields, such as in Fp for such prime p that p ≠ 1 (mod 3), but not necessarily: see the counterexample with rationals above. Also in F7 only three elements 0, ±1 are perfect cubes, of seven total. −1, 0, and 1 are perfect cubes anywhere and the only elements of a field equal to the own cubes: x3 − x = x(x − 1)(x + 1). Determination of the cubes of large numbers was very common in many ancient civilizations. Mesopotamian mathematicians created cuneiform tablets with tables for calculating cubes and cube roots by the Old Babylonian period (20th to 16th centuries BC). Cubic equations were known to the ancient Greek mathematician Diophantus. Hero of Alexandria devised a method for calculating cube roots in the 1st century CE. Methods for solving cubic equations and extracting cube roots appear in The Nine Chapters on the Mathematical Art, a Chinese mathematical text compiled around the 2nd century BCE and commented on by Liu Hui in the 3rd century CE. The Indian mathematician Aryabhata wrote an explanation of cubes in his work Aryabhatiya. In 2010 Alberto Zanoni found a new algorithm to compute the cube of a long integer in a certain range, faster than squaring-and-multiplying. ^ Huisman, Sander G. (27 Apr 2016). "Newer sums of three cubes". arXiv:1604.07746 [math.NT]. ^ Andrew R. Booker (9 Mar 2019). "Cracking the problem with 33". .
^ "A Collection of Algebraic Identities". ^ The multiplicative group of Fp is cyclic of order p − 1, and if it is not divisible by 3, then cubes define a group automorphism. ^ Cooke, Roger (8 November 2012). The History of Mathematics. John Wiley & Sons. p. 63. ISBN 978-1-118-46029-0. ^ Nemet-Nejat, Karen Rhea (1998). Daily Life in Ancient Mesopotamia. Greenwood Publishing Group. p. 306. ISBN 978-0-313-29497-6. ^ Smyly, J. Gilbart (1920). "Heron's Formula for Cube Root". Hermathena. Trinity College Dublin. 19 (42): 64–67. JSTOR 23037103. ^ Crossley, John; W.-C. Lun, Anthony (1999). The Nine Chapters on the Mathematical Art: Companion and Commentary. Oxford University Press. pp. 176, 213. ISBN 978-0-19-853936-0. ^ Bodrato, Marco; Zanoni, Alberto (2012). "A New Algorithm for Long Integer Cube Computation with Some Insight into Higher Powers". Lecture Notes in Computer Science: 34–46. doi:10.1007/978-3-642-32973-9_4. Hardy, G. H.; Wright, E. M. (1980). "An Introduction to the Theory of Numbers" (Fifth ed.). Oxford: Oxford University Press. ISBN 978-0-19-853171-5.